My toddler stands in our driveway, hands on hips, nodding appreciatively as he surveys our house. “Why thank you, Kind Sir!” I reply, suppressing a giggle at this real estate connoisseur in a Pull-Up. “Is it OUR house?” he asks, turning and squinting at me earnestly. “Yes, it is,” I answer, deciding that it’s not the time to quibble about property ownership vs. tenancy. D, at age three, wants to know what’s what. Often he asks me why we have to have a house, and I tell him that we need shelter from the sun and the rain and the heat and the cold, and that we’re so lucky to have it. I tell him that we have beds to sleep in, and they’re comfy and safe… I tell him that, if we didn’t have those things, life would be pretty hard for us. There seems to be some comfort for him in the repetition of these questions and the reassurance of my answers. He comes away from the exchange satisfied; but I’m not sure that I am. Every time my sweet child asks me about these things, I remember that our family has them – but that other families do not. Every time I answer his questions about the necessity of our shelter, I’m reminded of others who are constantly seeking a place to rest their heads at night. This repetition – this listing by my littlest of the comforts we enjoy that I might otherwise take for granted – is a great reminder for me that what we have is a delight. D acting as my own little reminder has helped put me in a posture of gratitude – so I thought I’d pass on the good turn. Consider this a little reminder to count your blessings. Let’s be grateful for all we have, and mindful of those who have not. “Nice place you got here!” – Indeed! 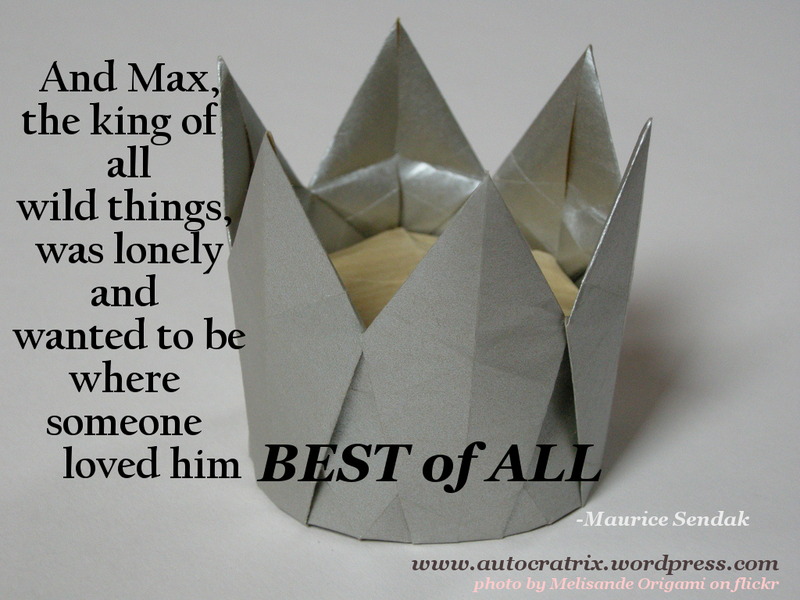 Someone in this world loves me ‘Best of All’. We were cuddled up together this morning as he gave me kisses and kisses and nose-nuzzles and squeezes and whispered sweet nothings to me – things like, “I love you SO much!”, and, “You’re the bestest Mama in the WHOLE WORLD!” (we can thank Doc McStuffins for that one…). And I just drank in his adoration and revelled in the extra love I was getting to make up for the good-night cuddles I missed when I was out for dinner with his Daddy last night. 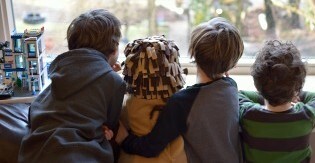 All my boys, as toddlers, have gone through a phase of being particularly attached to (and loving towards) their Mama. All of them lavished me with unsolicited cuddles, and all of them were reluctant to leave my side when they had to be separated from me – and they were quick to return to my arms when we were reunited. My second son asked his preschool teachers, “When’s Mummy coming?” so many times that they eventually struck up a deal with him that he could only inquire about my e.t.a. three times in a morning. My third son was happy enough with preschool, but he needed me to stay with him in the church nursery for ages, and even after he got used to it he’d make up for lost time with extra hugs and kisses when I picked him up. At home, he’d follow me around like a little curly-headed shadow. And now this little one is going through that stage where his world – and his devotion – centres on Mama. Right now, he loves me best of all. But it won’t last. This adoration – this devotion – is a natural phase. Some would say it’s a biological imperative – that, while children mature beyond the absolute necessity of our care in infancy, they demonstrate this heart-warming attachment to their parents to stir in us a protective response. But I think it’s more than that – I feel that it’s also a response to a nurtured bond between a mother (or other primary caregiver) and her child. Nevertheless – whether nature, nurture, or some combination of the two – it is temporary. I will hopefully always be beloved by my sons; I certainly know that they will always be beloved by me. But this stage of my being the very centre of their universe does not last, and nor is it meant to. Their world – and their hearts – open up as they grow. They realize that there’s room for loving and being attached to other people. And mothers lose their singular place in the lives of their children. As our kids grow into more independent beings – as they stretch their wings and take fledgling hops towards solo flight – they need us to provide for them a place where they know that they are loved best of all. Because, while young children take it for granted that everyone around them utterly adores them, older children understand that there are some limits to how adorable they are (and to whom they are adorable) and therefore need the assurance that home is still a safe and loving place. In the midst of peer pressure, negative experiences and the challenge of discerning between competing influences, older kids need to know that home is where they’re loved best of all. Fortunately for me, as a Christian I am able to give my kids some added assurance. Not only is home where they’re loved best of all; not only are we (their parents and family) the ones who love them best of all – there is Another who loves them best of all, too. He will sing and be joyful over you. God loves our kids unreservedly. God loves our kids eternally. God loves our kids personally. God loves our kids ‘best of all’. And they’re not the only ones, either. He loves us just the same. Best of all. No matter who we are or what we’ve done, no matter where we are in our faith – even regardless of whether or not we love him back – there will always be someone who loves each one of us ‘best of all’. And as He’s the One who was there before time began, we can be confident that it’s not just a passing phase. Please don’t forget that. Please don’t dismiss it or make excuses for why it can’t be true. Just know it. God loves YOU best of all.